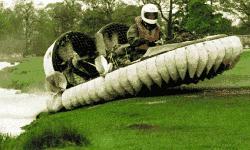 All modern hovercraft - large and small - use a skirt of one sort or another for their suspension system so that the power required to lift the craft can be minimised. 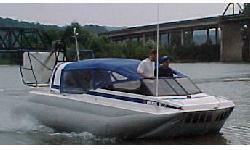 Contain the cushion of air beneath the craft at the required hoverheight. 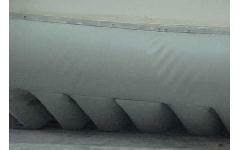 Have the ability to conform or contour efficiently over obstacles so as to keep the loss of cushion air to a minimum. Return to its original shape after having been deformed. Offer little resistance to the passage of obstacles beneath it. Be easily maintained on site without the need to lift or jack-up the craft. Have a long operating life. Be relatively simple to make and fit. Have a low maintenance cost. The initial cost of making the skirt may not be very low but it is important that once made and fitted, the skirt be cheaply maintained. Be tailored so that it is even in height above the ground all the way around the craft. One part of the skirt should not drag whilst another is 20 or 30 millimetres above the ground. presented in the following pages. Each has its own applications. The bag skirt employs an inflated bag surrounding the air cushion and it is the pressure of the bag which provides the stability. All three designs use the movement of the centre of pressure on the collapse of the skirt to provide stability, ie., when the skirt crumples as the edge of the craft drops, the effective contact point where the skirt touches the ground moves. There fore extra cushion area and thus more lift is provided at that side, moving the centre of lift pressure over and tending to raise the craft to restore it to a level position. The first action when designing a skirt is to decide upon the main use to which you will put the hovercraft and the type of terrain over which you intent to operate it. For a cruising craft that will be operated over water you will probably opt for the smooth but stable ride of the bag and finger skirt. If you fancy yourself as the driver of a racing hovercraft you may choose the full finger skirt which has very low drag characteristics or maybe a straight bag skirt if racing on terrain where hull damage would otherwise occur if a soft skirt were used. The next step is to develop a section through the side skirt geometry, deciding where to put the hull structure to pick up the skirt and remembering the hydro-dynamics of the hull form. The skirt and the hull shape must be designed together. Finger skirt hulls generally have rounded corners whereas those fitted with bag skirts usually have square or angular ones. At this point in designing a hovercraft a great deal of variation in the exact shape and size of the skirt and structure can be considered until the happy medium is found. The bow shape can now be developed in a similar way. The final stage is the development of the tailoring, splitting it into a sensible number of panels which, when sewn or glued together, adopt the shape required. These panels should be sufficient in number to enable the skirt to look smooth and free from stress when it is inflated. There should, however, be few enough panels to make construction of the skirt fairly simple and straightforward. Finally, you must decide on the type of material.